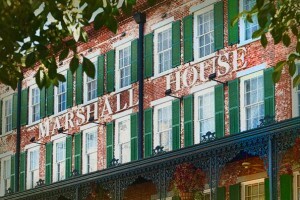 The Marshall House was established in 1851 in Georgia’s oldest city of Savannah. The Marshall House would endure the Civil War and a bout of Yellow Fever early in its history, which provided a grand setting for the hotel to latch onto its ghostly inhabitants. 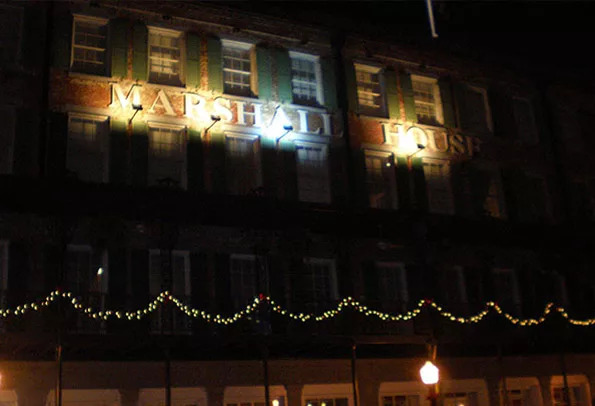 Today the Marshall House is one of the most haunted hotels in America with a ghoulish history that might leave a few in disbelief. During the Civil War Era, The Marshall House functioned as a Union hospital. In 1864, a frigid winter struck and the doctors were presented with a frightening problem. The doctors would be unable to bury the myriad of amputated arms and legs in the frozen ground. Their solution was grotesque in that it had them concealing the human remains underneath the floorboards throughout what is now the hotel. 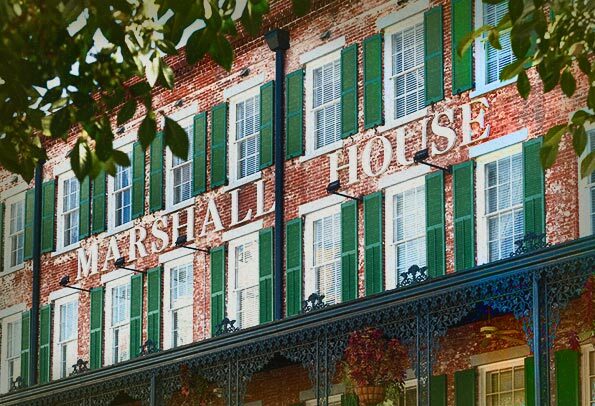 It wasn’t until 1999 when the hotel was restored that workers uncovered the Marshall House’s gruesome secret. 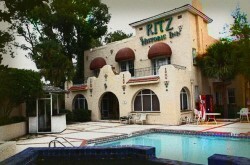 While replacing the hotel’s floorboards, the workers uncovered human remains. Little did they know the discovery would date back to the Civil War. Historians soon learned that the remains were from the old hospital and they were properly removed and the hotel restored. The ghosts of the Civil War had come full circle and the doctor’s secrets revealed. 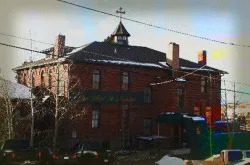 The remains were cleared, but many paranormal remnants are still attached to the hotel. 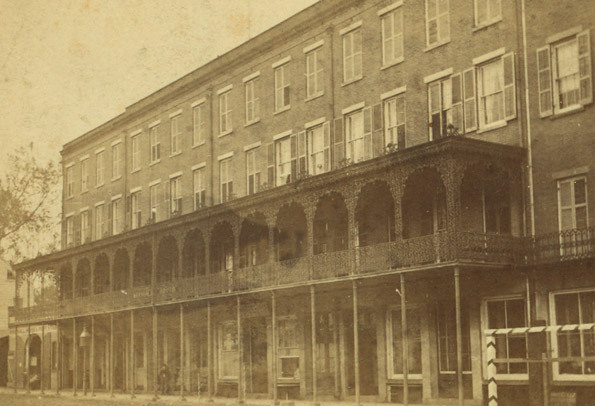 Ghosts envelop parts of the haunted hotel and have appeared as apparitions to guests. Many unexplained noises resonate in the late hours of night and even smells of rotting flesh inexplicably accost the senses. It has been reported on numerous accounts that the ghost of an amputee soldier walks aimlessly through the lobby of the hotel with his missing arm in hand as he beseeches guests to find him a surgeon. It is also said that the ghost of a woman haunts the ladies’ restroom and a stall will lock by itself. Late author Joel Chandler Harris was also a frequent visitor of The Marshall House before his passing, and various accounts have noted that there are times when the clacking of a typewriter can be heard reverberating from the room he used to stay in. One guest reported being unable to sleep due to macabre noises and smells. At one point, she recounts, there was even the feeling of being touched by a paranormal presence. “I always felt very uneasy and utterly creeped-out at night,” she stated. She goes on to say that she “heard strange noises in the hall late at night” and that she was very unnerved by her paranormal experiences. She went on to report that her husband’s sleep was interrupted by what he said sounded “like a child giggling in the sitting area,” but when he got up to turn on the light no one was there. There are many ghosts and haunts in Savannah, Georgia as it is noted as a historically haunted city. 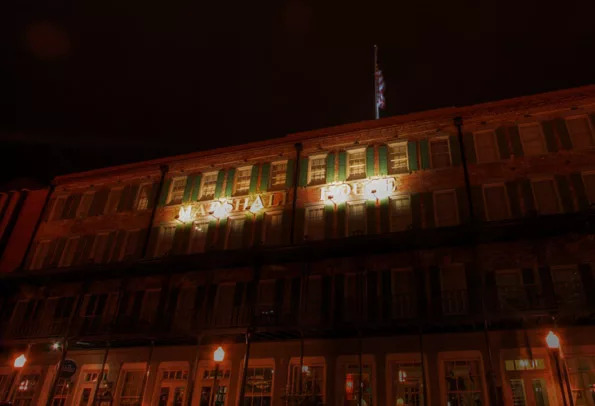 Savannah is home to a variety of ghost tours, haunted hotels, and spooky stories and The Marshall House one of the more famous haunt experiences in the state. 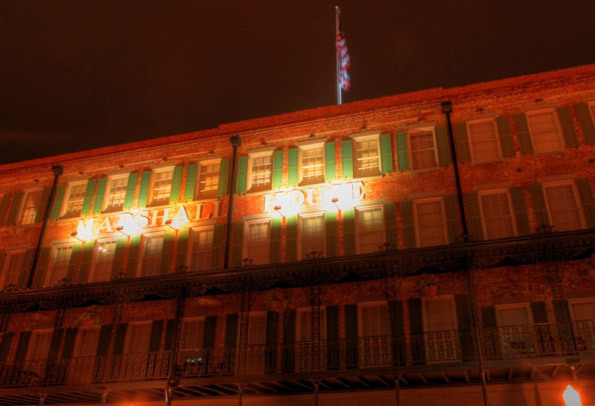 If you stay at the Marshall, check in to hear some of the previous guest’s haunted stories as the hotel collects many of the spectacular tales for story time. The 4th floor is where the most haunted activity has been reported. What happened in Room 414? Are the ghosts of the Civil War finally at peace? Have all of the remains truly been discovered? If you want the 4th floor, book in advance. 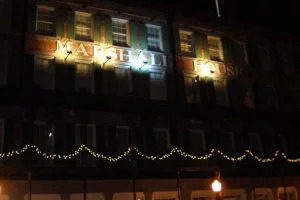 Also, when planning your stay at The Marshall House try for a Thursday or a Sunday as the hotel puts on a history talk in the library discussing the Marshalls, history of the haunted building, and the many stories and experiences with ghosts over the years. It makes for a great addition to your spooky stay. My husband and I stayed at the Marshall house last night with our 6 month old. I heard it was haunted but didn’t expect what happened to me! When we first got there we climbed out our window to the balcony and as we were standing out there.. one of the rocking chairs just started rocking. It wasn’t from wind, and none of the other chairs were rocking. It was like someone was sitting and rocking! It went on for a few minutes. Then, later in the night the three of us were all asleep in bed and I was woken by what felt like fingers tapping up my back and grabbed my shoulder. I started yelling and grabbed my husband. Needless to say I didn’t sleep for the rest of the night and heard all kinds of other noises. I heard a baby crying… tapping… I’m pretty sure my son was the only baby/kid in the whole hotel. I stayed at this hotel next door to room 414 and heard at least 50 people walking back and forth in front of our door at 4:00am, but no talking or doors closing. Then it was as if they tried to push my door open but never touched the handle, then heard sounds like paper sliding under my door into our room. Then heavy shoe sounds like walking inside to our fireplace then the walking went thru the door. Then it sounded like little rocks hitting the floor in the fireplace then under our armoire. It turned out that sound was from children playing with marbles but there were no children next door and i was defiently freaked out of my mind. My hair on my neck stood up and goosebumps galore. This was heck of an adventure but completely unexpected. Goodbye Savannah, Ga. I stayed in room 214 in October 2015. I had no idea the hotel was haunted and I did not believe in ghosts. I was woken up around dawn by what felt like a hand gently pulling the covers off my legs and then running her hands down my legs to wake me up. I saw a white haze at the end of the bed. While this was happening, it was as if I was trying to scream but couldn’t, similar to the heaviness you mention holding you down and preventing speech. I wonder if this was the nurse figure waking me up during her morning rounds. I truly believe we both had the same encounter. The simularities are too particular not to be….. Yes. I just had this haunted experience last night. We stayed in room 213 at the Marshall House. I felt like I couldn’t speak or move. I literally felt paralyzed. My husband was lying next to me and I tried to say his name but there were no words coming out. I felt like I couldn’t catch my breath. 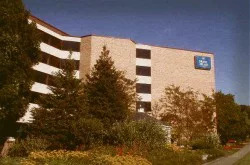 My husband and I stayed in the hotel Friday night and Saturday night 4th floor room 412. Early Saturday morning at 4:40am I remember because when I woke up I looked right at the clock. I heard heavy heavy footsteps right at our door. And early Saturday around 2am same heavy footsteps right outside the door. Then around 4am i heard knocking and then sleep paralysis kicked in. I did not get any sleep. We will be back.